Derrick Henry was destined for college stardom after his 12,124 career rushing yards and 153 career touchdowns in high school alone. Taking over as the lead back in the Crimson Tide backfield in 2015, Henry broke out in a huge way, running for 2,219 yards and 28 touchdowns, leading Alabama to the 2016 CFP National Championship. With his sights set on the NFL, Henry has declared for the 2016 NFL Draft and was drafted by the Tennessee Titans in the 2nd Round. 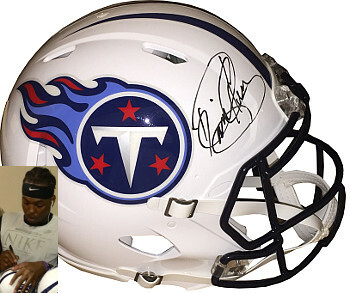 Derrick Henry has hand signed this Tennessee Titans Full Size Speed Authentic Revolution Helmet. Photo of the Signing, Steiner Sports Hologram and Certificate of Authenticity.